Adin B. Underwood (1828-88), Brigadier General, USA (MA). Participated in the 1862 Shenandoah Valley Campaign, Chancellorsville, Gettysburg, Chattanooga, Wauhatchie (WIA). 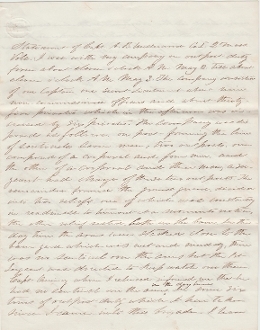 Letter Signed (LS), no place, no date (circa Camp near New Market, VA 5/10/62) as Capt. Co. I, 2nd Massachusetts Infantry. I instructed the sentinels to perform their duty with the least possible noise so that indications of their positions should not be given to the enemy. It is quite possible under their instructions that when the officer of the day was approaching an outpost without making any attempt to pass one or canceal himself he was allowed tp approach near before being challenged. In all my times of outpost duty one commissioned officer only on duty at a time was considered sufficient. Nothing on the contrary was ever said by the officer of the day. A.B. Underwood, Capt. Co I 2nd Mass." An interesting glimpse of the formation of the outposts and how seriously their duties were viewed.